Blue Eyed Grass Sisyrinchium Bellum is a rhizomatous perennial that belongs to the Iris family. Blue Eyed Grass seeds are easy to grow, and despite the plant is not exactly a grass, it is categorized as the ornamental grass because of its grassy blade-like foliage. This native wildflower produces masses of small blue to purple flowers in spring and summer. The blooming Sisyrinchium Bellum creates a delightful display in any garden and attracts bees and butterflies. Blue Eyed Grass is an excellent plant to grow in cottage and rock gardens. This low growing perennial is also exceptionally great for border planting and along pathways. 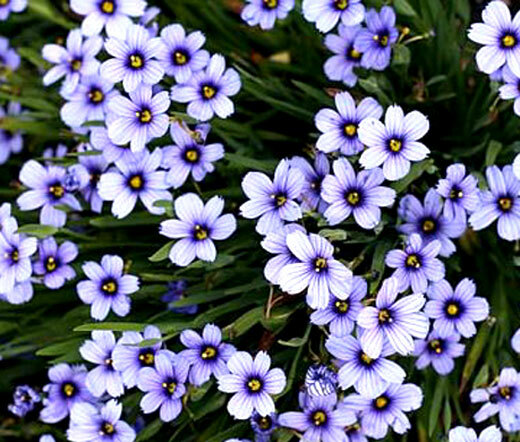 The planting Sisyrinchium Bellum seeds is an economical way to establish Blue Eyed Grass plant that is very drought and cold tolerant down to 10 degrees Fahrenheit. Sisyrinchium Bellum grows best in full sun or partial shade and benefits from moist soil during flowering period; however, the soil has to be dry in summer.